Size -10 to 12½ inches in height allowed, with desired height 11 to 11½ inches measured at highest point of the shoulder blades. Disqualification - Under 10 inches or over 12½ inches in height. Length of males equals height at withers. Females may be slightly longer. Neck proportioned to head and body, slightly arched, gracefully curved, blending into shoulders, muscular and free from suggestion of dewlap or throatiness. Topline - Back level or slightly sloping toward the rear both when standing and gaiting. Body compact, slightly wedge-shaped, muscular. Forechest well developed. Well-sprung ribs . Depth of brisket, the base line of which is level with points of the elbows. Belly moderately tucked up to denote grace of structural form. Short and strong in loin. Croup level with topline. Tail set high, held erect, docked in proportion to size of dog. Solid clear red. Stag red (red with intermingling of black hairs). Black with sharply defined rust-red markings on cheeks, lips, lower jaw, throat, twin spots above eyes and chest, lower half of forelegs, inside of hind legs and vent region, lower portion of hocks and feet. Black pencil stripes on toes. Chocolate with rust-red markings the same as specified for blacks, except brown pencil stripes on toes. In the solid red and stag red a rich vibrant medium to dark shade is preferred. Disqualifications - Any color other than listed. Thumb mark (patch of black hair surrounded by rust on the front of the foreleg between the foot and the wrist; on chocolates, the patch is chocolate hair). White on any part of dog which exceeds ½ inch in its longest dimension. Under 10 inches or over 12½ inches in height. Any color other than listed. Thumb mark (patch of black hair surrounded by rust on the front of the foreleg between the foot and the wrist; on chocolates, the patch is chocolate hair). White on any part of dog which exceeds ½ inch in its longest dimension. Click Here to see required genetic breed tests for dog breeds beginning with the letter M.
Click Here to Learn about breeder background checks on Miniature Pinscher breeders if you are looking for Miniature Pinscher puppies for sale. Click Here to learn how ResearchBreeder.com can help you find healthy Miniature Pinscher puppies for sale. Click Here to order a Breeder or Kennel Background Check on Miniature Pinscher Breeders that may have Miniature Pinscher puppies for sale. 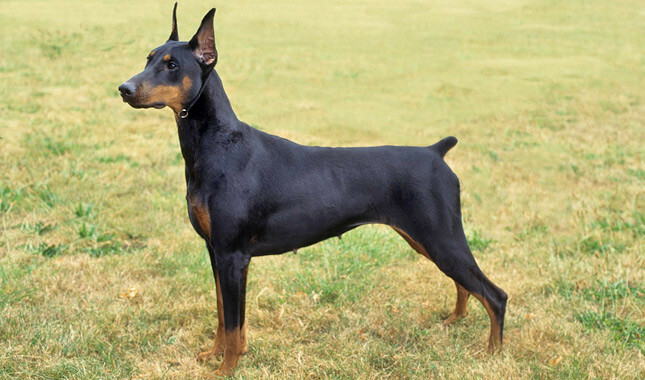 Click here to find the national breed club for Miniature Pinscher puppies for sale. Click Here to purchase a list of approved ResearchBreeder.com Miniature Pinscher Breeders who have Miniature Pinscher puppies for sale.